As soon as the summer months arrive, kids start asking about new bicycles and new skateboards. However, there are electric alternatives to those now, and they are well sought-after by both parents and kids. That’s why we would like to introduce Razor’s Electric Motocross Bike, which is a compact, authentic, chain-driven bike for kids over 16 years of age. For younger children, the Razor MX350 electric dirt bike is more suitable. However, for four wheels: try the Razor Dune Buggy. Electric skateboards, kids dirt bikes, kick scooters (check out razor electric scooters), cars and carts (check out the Razor crazy cart review) are usually products that are reserved for the youngest kids, kids aged between 7-12 years of age. Razor knows that older teens like to have fun too, especially on daredevil-looking toys like the Electric Motocross Bike. The older the kids get, the more they can get sucked in to the world of the internet and forget about the beautiful nature of the outside world. Razor is aware of this, and that’s why they made a bike that looks attractive and menacing, to help attract older kids. It’s no secret that most parents want to get their teens out of the house during the summer break when they’re sitting home. 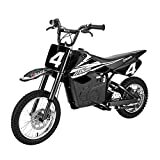 Purchasing the Electric Motocross Bike can help with that; not only is it extremely fun to ride, but it can be a great neighborhood toy to share with other kids and attract them to play, too. Razor have also created a durt quad bike! Since we know that electric bikes for kids are a relatively new thing, we decided to list and discuss all of their features. From battery life, to safety, to speed limits and charging. If you are interested in finding out more about these Razor MX650 Dirt Bikes, read on! Looking for something different? Razor have brought out a skateboard, the Razor Ripstick Ripster! Razor’s Dirt Rocket Electric Motocross Bike has a battery unlike many Razor products. Usually, the electric dirt bikes and electric scooters for younger kids have a 24-volt battery pack and need to be charged for 14-15 hours before each ride. The Dirt Rocket Motocross Bike has a 36-volt battery pack, can run up to 1 hour (10 miles) on a single charge and has to be charged for only 8 hrs before each ride. This means that you won’t have to worry as much about your electricity bills. If your child generally spends up to 8 hours or more on their laptop or in front of a TV, those 8 hrs of electricity will just go to charging the bike. This way, you can teach your child to be more responsible and practical. They will learn how to be efficient, and their reward can be riding their precious new electric bike. The 8 hrs of charge can also help train your kids in patience since that’s a common problem with kids it’s important to try and deal with it early on. Even though with common use the Dirt Rocket only requires 8 hrs of charge, it’s important to give it a big, long, initial charge. We recommend for the first charge to be around 12 hrs, since the bike will undoubtedly need a big kick of power after being locked and packed up in a box in a storage space all this time. It might also be a good idea to take out the battery and charge it before your child notices the bike arrived if the motocross is supposed to be a present. This will spare a wave of disappointment when the child will learn that they will need to wait a day to even use their new gift! With all of this said, with regular use the 8 hrs of charge may take a toll on the electricity bills. It’s important to take that into consideration before purchasing the Razor MX650 Dirt Rocket. It can also be a good idea to ask other parents who own similar toys about the changes they noticed in their bills after buying and regularly using the toy. Generally, this Razor MX640 Dirt Rocket is meant for older children. The original website description of the product states that the dirt bike would be ideal for kids over 16 years of age. However, anyone who has owned a Razor product before, or has even heard of their merchandise, knows that their products are versatile. For example, there are plenty of kids that are very tall for their age. Despite the 16+ guidelines, many parents allow kids as young as 10 to ride this dirt bike. It’s ideal for any child above 10 years of age that is responsible enough to stay safe and responsible while riding. Most of Razor’s guidelines are centered around the maturity of the rider and their ability to control the dirt bike. 10 year olds may have trouble staying safe on such a powerful vehicle. However, as long as they are supervised and know the instructions of how to use the MX650 dirt bike, they should be able to use it for 6+ years after receiving it. Hopefully, they will also be able to pass it on to younger siblings when they get too big for it, even though adults can still fit pretty well on the seat! We don’t recommend giving this Razor dirt bike to kids below the age of 10. Kids under 10 should have less powerful kids bikes, such as ones with a 24-volt battery. The Motocross Bike has a 36-volt battery with a control module which makes it significantly more powerful and controlling it may be an issue for younger kids. The electric dirt bike is powered by a 650-watt battery and can carry itself to speeds that can go way above 17mph, sometimes reaching up to 25mph. The speed can always be customized by tinkering with the bike, and this may have the kids take interested in engineering as they get older and want to manually try and increase the variable speed of the bike. The regular 17-25mph variable speed provided with this Razor MX650 dirt rocket means that it’s nearly twice as fast as the regular electric vehicles that are meant for younger kids. Once again this reinforces the idea that only kids above 10 should try riding this MX650 dirt rocket. The riser handlebars will provide the teen with a grip that will feel comfortable and well-balanced. The bike itself runs quietly, which is something that the neighbors will undoubtedly thank you for. Razor’s dirt bike is 100% safe if it is used properly. We recommend buying your child a youth helmet and perhaps knee pads and elbow pads. This will ensure that they will stay safe when riding should any accidents occur. The MX650 dirt bike will come with a manual, and it’s important to read it through with the child before they get onto their new prized possession.This will ensure that they will be aware of any dangers and how they should operate the bike when they are outside having fun. The design of the Razor MX650 Dirt Rocket is inspired by supercross motorbikes and the steel construction will help keep your teen safe and stable when riding. The large 16 inch pneumatic back and front wheel allow for quick, solid riding that will help them speed through various terrains and neighborhoods. The riser handlebars are of course adjustable and the bike also has folding metal foot pegs as well as hand-operated dual disc brakes. The brakes are exceptionally sensitive and will pause the bike any time they will be pressed. The bike itself may also require some wheel assembly, but it shouldn’t take more than half an hour. It can also take up to 220 pounds of weight and has a kickstand that you can use when you will want to stop in unusual places where there won’t be anywhere to lean your bike. The Razor Dirt Rocket MX650 is ideal for all kids above 16 years of age. This is due to the 16+ age recommendation, although we have seen parents of 10 year olds purchase these kids bikes for their little ones. MX650 electric dirt bikes are one of our favorite products since they are meant to be used by older teens; a market that doesn’t get that many electric-vehicle toys. Razor decided to provide their older customers with something special, fun and fast. This bike is fully safe, can go at great speeds and will allow your teen to quietly speed around the neighborhood thanks to the silent motor. If you are looking for alternative street bikes, then we can wholeheartedly recommend the Razor Electric Street Bike. It’s powered by three 12v batteries, can be ridden for over an hour before charging, has soft, comfortable rubber handles, a retractable kickstand, folding foot pegs and a hidden compartment where you can hide all your necessary belongings.